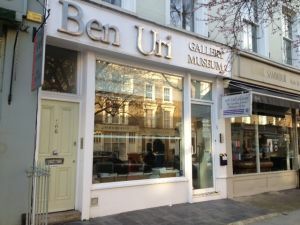 Ben Uri is an Art Museum and educational charity, founded in July 1915 in Whitechapel, East London by a Russian emigre Jewish artist, Lazar Berson. Known as 'The Art Museum for Everyone', the museum collection and programme of events both focus on the universal themes of Art, Identity and Migration. The Ben Uri Collection is internationally recognised and encompasses over 1300 works, principally from the opening decades of the 20th century, including Chagall, Auerbach, Bomberg, Epstein, Gertler, Grosz, Liebermann, Pissarro, Solomon, Kossoff, Soutine, Ury, and Wolmark. Ben Uri presents 4 major exhibitions a year. Note: though Kilburn Park is the nearest tube station 'as the crow flies', for practical purposes the St Johns Wood station is more convenient! Location: Off Abbey Road. Nearest tube is St Johns Wood. Parking on Boundary Road (free at weekends).